Many of you know that I’ve been working on my first novel, and now I’ve reached the next step in the writing process. For the past few weeks, my manuscript has been in the capable hands of my editor, Susan Hughes, owner of My Independent Editor. It won’t be long before her work is completed and my revision process begins once more. You’ve heard it again and again…writing and rewriting. And yes, that is part of the process, if you want the final result to be your best work. You’ll recall how I spent two weeks in the serene environment of the Amalfi Coast overlooking the Tyrhennian Sea. Yes, it was a dream for me to be able to spend that time in Positano, a magical place for me. So for the revision, I still need to have silence and need to be alone so I have no distractions. Although I like to write near the ocean, need to do this part of the process on the laptop, so I will be home in my office. But, I am tempted to take the laptop outside onto the patio, and work from there. My pool has a jacuzzi attached, and the water gently falls from from the jacuzzi back into the pool to recirculate. The sound is gentle, like a quiet small waterfall, so it’s relaxing. If I need a break, or some inspiration, I may print out a chapter and head to my beach, twenty-five minutes away. Critical Cover-Up is my first novel, and so it’s nothing like any of of my other books. This is a work of fiction, and I have been working on it for two and a half years, the longest of any of my books. The setting is Florida, and you won’t find any references to Bella Italia. I’ll soon be sharing my cover with you, as well as a synopsis, so please stay tuned for more updates. With some luck, I’m hoping to be able to publish Critical Cover-Up in late spring, depending on how the rewriting/revision goes. It will be available on Amazon.com as well as in the UK and other countries in digital format as well as paperback. Enjoy a few photos from my inspiring place at home in Florida. How about you? What relaxes you? Where is your go-to place to feel inspired? I’m eager to hear your feedback so please leave a comment. Check out my Facebook Author page and LIKE my page for all the latest updates on my books. Tuscany is one of the most popular destinations in Italy, and these photos easily explain why. Located in central Italy, Tuscany stretches from the Apennine Mountains to the Tyrrhenian Sea. From the rolling hills with scenes of serene countryside dotted with wineries, to vibrant cities famous for art, architecture, and food, and to the pristine seashore, Tuscany has it all. Please enjoy 25 of my favorite photos of Tuscany. The incredible marble quarries in Carrara, where the marble for Michelangelo’s David was acquired. Fog over the mountains in Ponte a Serraglio, one of the villages of Bagni di Lucca. Rocca e Parco Montestaffoli is the highest point in San Gimignano and well worth the walk up the hill to reach this peaceful setting. If you’d like to read more about Tuscany, you might enjoy traveling along with me in Memoirs of a Solo Traveler – My Love Affair with Italy, currently available on Amazon and Amazon UK. Have you been to Tuscany? What was your experience? I’d love to hear about it, so please leave a comment. Follow me on my Facebook Author page to stay updated on all things Italy. Last week Italy travelers were affected by an airport strike. So what’s new, right? Strikes in Italy are commonplace, part of the lifestyle. They can occur with all modes of transportation, and they do, on a regular basis. During my travels to Italy, I have personally been affected by taxi, bus, and train strikes. And in Venice, even a vaporetto strike. In Italy these limited work stoppages usually last from 4-24 hours, and are generally posted in advance. They can be a nuisance, but it pays to be flexible. These scheduled strikes, called scioperi in Italian, are publicized in advance so if you’re planning to travel to Italy, it would be wise to google Italy transportation strikes and check whether any of your travel plans may be affected. This is the official page in Italian. To make things easier, this is the best site in English: Easy Travel Report. Just click on “Italian strikes” to get to the Italy section. It;s pretty easy. I have also learned that usually, on days when strikes are held, Trenitalia will guarantee minimum transport services. Many times, if you ask a local, they will know. This recent article posted on Euronews includes some great information and details on how to survive Italian airport strikes. And social media usually is the frst place to find updated information. The Twitter sites of the major carriers usually post the latest updates so during a strike, they can be a good source of information. Sometimes, though, the train station personnel are not updated so quickly on small regional train strikes, so it can be chaotic. And one time, I just arrived in Salerno by train in the evening. My plan was to take the bus to Amalfi. When I approached the bus area, the bus was there, but it was dark. I walked into the train station and found a travel information office. While waiting my turn, I was anticipating having to take a taxi, which would likely have cost around 80 to 100 euros. Luck was on my side because the kind woman at the information desk told me that the bus was just getting ready to leave. The strike was over. So sometimes things do work out. Don’t let a strike ruin all your plans. You never know in Italy. Flexibility is the name of the game, and it is always good to have a back-up plan. Have you been affected by a strike in Italy? I’d love to her your feedback, so please share your story in the comments. You may want to read about some of my personal experiences with transportation strikes in Italy in my first book, Memoirs of a Solo Traveler – My Love Affair with Italy. Available on Amazon in paperback and Kindle editions. Click on book to purchase. Also available on Amazon UK. Click here to purchase. You know, you can do the same thing ten times and still learn from your experience. And this certainly holds true for travel. No matter how many times I travel to Italy I learn something new, sometimes through challenging experiences. On my most recent trip, I flew into Milan, before heading south to Positano and Sicily. So, like any traveler, I wanted to make the most of my time in Milan. On my agenda was to try to get tickets to visit The Last Supper. Highly recommended but always requiring reservations, I decided to see what I could accomplish. Finally, after hours and days of research, I managed to find a tour that was offered during the tight window of date and time I had available. Since The Last Supper can only be experienced in a group and usually combined with a tour, I was happy with whatever I found. So even though this tour began at 3:30pm, and included a walking tour of Milan, I decided to book it, figuring I could see The Last Supper, and then just leave the tour whenever I felt like it, in order to make another meetup I had arranged for an aperitivo with a friend in the center of Milan. First mistake – Making arrangements which included specific times for the day of arrival in Italy. After traveling all night on a nine-hour flight (sometimes much more, depending on the departure airport in the States), the stress of making a timed event can be overwhelming. While my flight arrived at Malpensa at noon, I had failed to take into consideration the delays at baggage claim, and also at the Milano Express train station inside the airport. It quickly became apparent to me that I would not have enough time to check into my hotel and freshen up. So I decided to opt to leave my bag at the Left Luggage area inside Milano Centrale station, and take a taxi to Piazza del Duomo, where I was to meet the tour. Between locating the luggage deposit area inside the station, waiting in line, and then hailing a taxi, the time was quickly disappearing, and I was feeling the stress of being late and missing my tour. I also hadn’t planned on the traffic in the city, and why not? Milan is the capital of Italy, the country’s most populated city. As of 2016 the urban area of Milan boasts a population of 3.1 million in 2016, and the city proper is lists a population of around 1.7 million. So naturally the 10-minute taxi ride turned into a 30-minute ride. I don’t normally stress about too much, but being late or missing an event because of a time constraint, definitely pushes my patience. At 3:29pm we were stopped at a light at one of the corners of the piazza, and I spotted the meeting location, told the taxi driver I was getting out, paid him and literally ran across the street, just in time to see a tour guide with a group surrounding her. Like a crazy tourist, I was out of breath as I reached the group and announced my presence, grateful that I had made it. Forget what I must have looked like. It was a hot day, so my Italian hair was definitely not going to do what I would like. But that’s okay because I was in Piazza del Duomo and I was also finally going to see The Last Supper. I have no idea why I expected The Last Supper to be the first stop, but soon I realized from the tour guide’s instructions, that not only was it not going to be first, but that the tour would last 3 hours, and at 6:00 or 6:15 we would be able to view The Last Supper for exactly 15 minutes. So, on top of being tired, stressed, and exasperated, I worried about having time afterwards, to get back to the Milan train station, retrieve my bag, and check into my hotel, and freshen up, all before meeting my friend at 7:30 for our arranged aperitivo. But what else could I do? I had prepaid for the tour, and if I didn’t go, who knows when I’d get to see The Last Supper? So now I’m on a 3-hour walking tour of Milano to sites that I have already seen more than once. Did I mention that the temperature was over 80 degrees? To be fair, I did learn some things I didn’t know on this city tour. But my main interest was The Last Supper, and eventually it was time. At 6:00pm we finally arrived at Santa Maria delle Grazie, the church which contains the mural of The Last Supper by Leonardo da Vinci. Our group had to wait until our assigned time of 6:15, where only 30 people are allowed at a time to view the masterpiece. At exactly 6:15pm, we filed into the space, where we could experience this incredible fresco painted on the wall inside the convent. The wait was worth it, and I will follow up with another blog post detailing my experience inside this special place. Because of the rush and the stress, I know that I coudn’t fully appreciate this opportunity as much as I would have liked. After I said goodbye to the group, I walked several blocks to the metro station, bought a ticket, and and rode to the train station, where I retrieved my bag. I had just enough time to shower, and freshen up before then, and finally was able to unwind and enjoy the evening in Milan. So the moral of the story…Although I got plenty of exercise today (walked 6 miles), I’d advise not to plan to do too much in one day, and especially on the day of travel. And for sure don’t make plans which include specific times or deadlines on the day you arrive in Italy. You can be sure I won’t make this mistake again. Have you made mistakes while traveling that you’d like to share? I’d love to hear your feedback, so please leave a comment. Emerging out of the depths of the Tyrrhenian Sea are mammoth rock formations. I experience a magical moment when I first see the towering “sea stacks” located at the southern end of the island of Capri. They cause me to pause and to wonder about their splendor. A result of forceful winds and raging seas, these three Faraglioni rocks inspire countless photographers who attempt to capture their beauty. Translated, Faraglioni means “ones of the light,” and reflections of light from the azure sea create a constantly changing vision just off the Amalfi Coast and Sorrentine peninsula. I am mesmerized as my ferry approaches Capri and all three Faraglioni come into a clear view. The largest and closest to Capri is attached to land by a short isthmus. Known as Stella, or Faraglioni di terra, the dramatic pinnacle reaches a height of 365 feet, or 110 meters. The middle stone formation, called Faraglioni di Mezzo, is recognized by its natural archway, which delights photographers who might be able to perfectly frame a passing boat within its walls. The shortest of the three rocks, Faraglioni di Fuori, peaks at 265 feet or 80 meters. Also known as Scopolo, it is the home to the blue lizard, which is found nowhere else in the world. These iconic symbols associated with the isle of Capri welcome me with grandeur. ~Excerpt from my latest book, Colors of Naples and the Amalfi Coast. 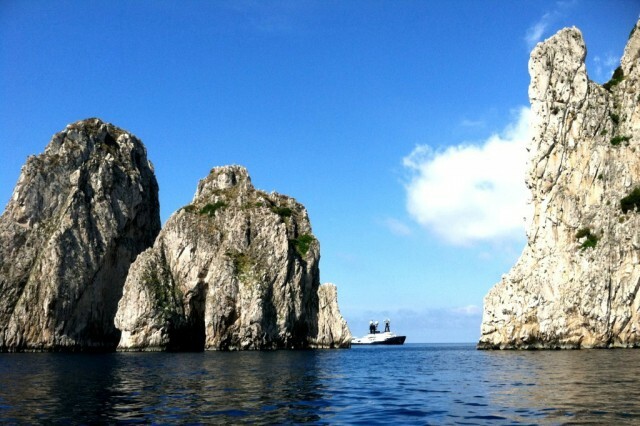 Have you taken a ferry to Capri and passed by these Faraglioni rocks? I’d love to hear your feedback, so please leave a comment. Thank you Diana for leaving a comment with a link to the Dolce and Gabbana commercial filmed here. (I’ve added it to my post). Italy is a photographer’s dream, with views to die for everywhere I go. So to choose one place where the view is a favorite is impossible…Enjoy just a few of my most memorable scenes from my travels to Bella Italia. Can you guess where they are? If you scroll to the end, I’ll share the locations. Okay, here are the locations. How many did you get right? What do you think? I’d love to hear your thoughts so please leave a comment. Grazie and ciao. If you enjoyed these photos, you may like my photo book about Naples and the Amalfi Coast, available on Amazon. Whenever I travel to Italy, my camera is a necessity, to capture the memories of a place and its photographic images forever. 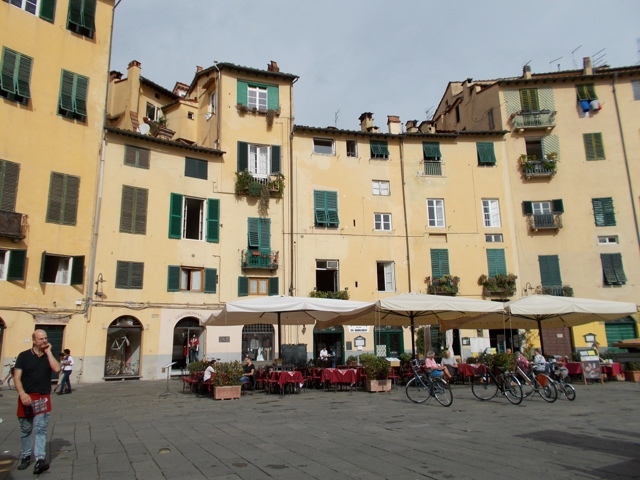 The images are from Lucca, a delightful city in Tuscany not far from Pisa or Florence. 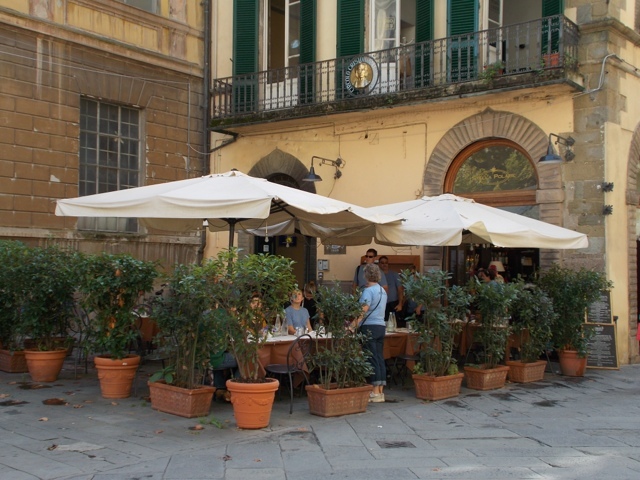 If you want to spend a day off the beaten path in Italy, make time to enjoy the quiet Tuscan town of Lucca. Lucca is easily accessible by train from Florence or Pisa, and once you arrive at the train station in Lucca, it is less than a 10-minute walk to the town. Lucca’s uniqueness lies in the fact that this historic center is completely encircled within intact medieval walls. These walls, which date back to the Renaissance measure four kilometers in distance, are 40 feet high and 100 feet wide at their base. You can’t miss seeing the wall, and walking or bicycling along it is the best way to begin your experience in Lucca. On top of this promenade are trees and grass and the area has a park-like appearance, with plenty of spaces to walk, ride, or sit and enjoy the scenery. The views are phenomenal, and at various points along the walkway, you will find entrances that lead down into the town inside the walls. Inside the walls the streets are basically pedestrian except for those who live here. A few hours in the lovely town of Lucca left me wanting more. I’ve only visited twice, but know I will return. We take what we can get. Enjoy these images of Lucca. I love these smart car postal vehicles, perfect for maneuvering the narrow streets. The town of Lucca is exceptionally clean, and you will even find that the residents take responsibility for cleaning up after their dogs. By installing reminder signs (Fido Lindo) with bag dispensers, at intervals along the walls, Lucca encourages pet owners to clean up after their animals. 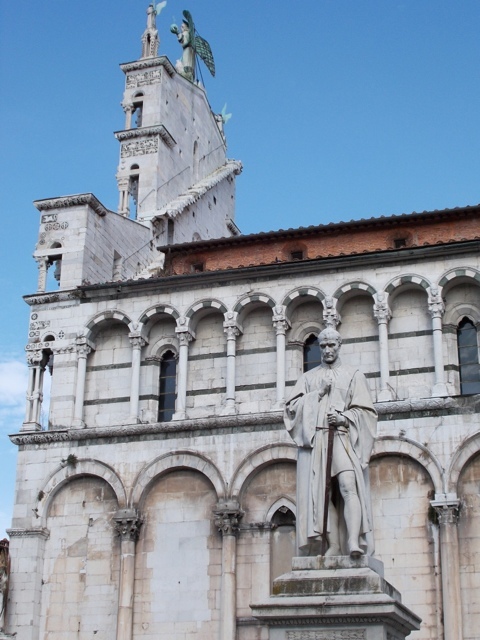 The Cathedral of San Martino is located in Piazza San Martino, a main square in Lucca. 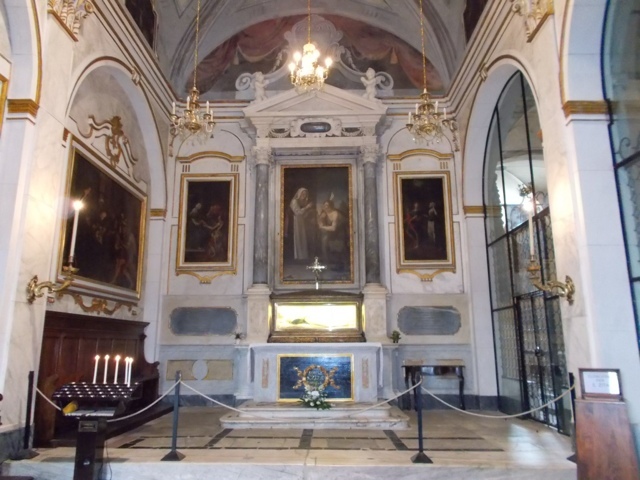 Founded by San Frediano in the 6th century, the church was rebuilt in 1060, and rebuilt again between the 12th and 13th century. Inside the walls of the city of Lucca, the homes, buildings and 100 churches date back to the 16th century, and no modern or new construction exists here. You truly feel as if you have been transported to another time, especially as you see gelato vendors on bicycles, Lucchese men playing chess outside, and Italian women dressed in long skirts, pushing bambini in their strollers. You can climb the stairs to the top of Torre Guinigi for a breathtaking view of the entire city and Tuscan countryside. The tower is 44 meters high, with oak trees growing on top of it. For anyone who is a lover of opera, you will be thrilled to visit the birthplace of Giacomo Puccini, famous composer of the well-known La Boheme and Madame Butterfly. His 15th century home is now a museum, where you can view his Steinway piano, which he used while composing his last works. This is the city center and it is situated in the area of the ancient Roman forum. This is also the home to the financial and trade meetings of local Italian businesses. If you are an architecture lover, you will easily be able to spend many hours in this piazza alone. The 15th and 16th century banks in the piazza are former palaces, and the Church of San Michele is a 12th century cathedral which dominates the piazza. 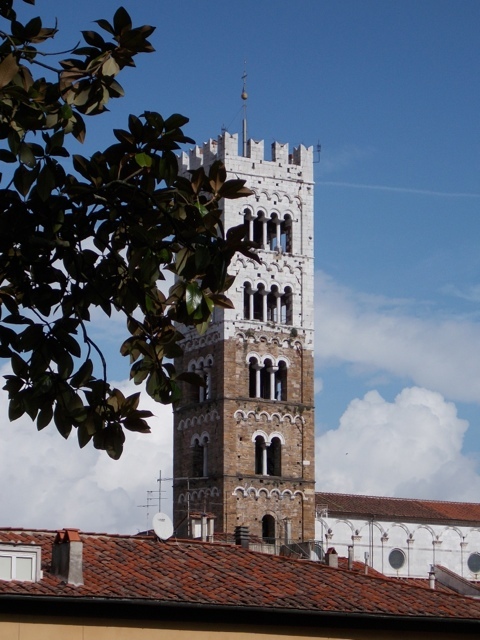 Have you been to Lucca? I’d love to hear your feedback, so please leave a comment. When someone asks me why I love Italy, I can’t believe they even have to ask. All you have to do is see a few photos and your heart will melt at the sheer beauty of this amazing country. But it’s not just the beauty, the rugged coastlines, the verdant green hillsides in Tuscany, the diverse architectural styles, the delicious food, or its many iconic monuments. No, it’s the people that really make this country special, and I’ve been lucky enough to meet many special Italians during my eight trips to Italy these past ten years. A smile from an elderly gentleman, a wave from a cyclist, a handshake from a vendor, and an invitation to join them for lunch are just a few memories I have from my visits to Italy. So sit back and enjoy these photographic memories and travel vicariously back to Italy with me. These are just a sampling of reasons why I love Italy. Check out my previous blog posts for more stories and photos all over Italy. Why do you love Italy? I’d love to know, and you don’t have to choose just one reason. So please leave a comment and share your own reasons for loving Italy. If you enjoyed this post and want to read more about my love affair with Italy, please check out my books, available on Amazon and Amazon UK. Who hasn’t dreamed of sailing around Sicily? A few months ago, at the end of my Sicilian road trip with Victoria De Maio as #2SicilianGals, I had the opportunity to enjoy the scenic coast of Taormina from the Ionian Sea on a beautiful 42-foot sailboat. Thanks to the generosity of Simona Ferro from Tripping Sicily, this day of sailing around Taormina was a highlight of my trip in Sicily. Simona’s company provides personal custom luxurious cruises on yachts and sailboats, Jeep expeditions to Etna, wine tastings and cooking classes, and much more. It was after reading about this excursion on the blog, White Almond Sicily, by Sarah Kearney, that prompted me to dream about experiencing Taormina from the vantage point of the Ionian Sea. Victoria and I were ready for some R&R after driving through Sicily on a fun whirlwind 10-day road trip. Having only interacted with Sarah and Simona online, this day we would finally meet in person in Sicilia! The very accommodating and friendly Sarah offered to arrange a car and very attractive driver to “collect” us (as Sarah says – she’s British) at our hotel in Taormina and whisk us off to the nearby port of Giardini-Naxos. We thought this was great, as we had navigated enough narrow streets by this time, and our car was safely tucked away in the hotel parking garage. Thank you, Sarah. When Sarah arrived, her smile immediately created a sense of friendship, as if we had already known each other. Did I mention that the driver from Franco Group was a drop-dead gorgeous guy named Vincenzo? He looked as if he walked straight out of GQ magazine! Along with some delicious prosecco, we enjoyed a variety of these delights like pate di caponata, pistacchio, and sundried tomatao served on bread, bruschetta! Absolutely delicious! Although I have had few sailing experiences, I love being on the open water and feeling the wind against my face. This fabulous sailboat was a 42-foot Sun Odyssey, Carolina, owned by Maria Letizia and Giovanni Musmeci, and they were both there as well. What nice people! Maria Letizia pouring prosecco…This is the luxury lifestyle! We had such a wonderful time listening to stories and learning about the history of Taormina from Simona and Adriana, who have both lived here for most of their lives. Although it was cloudy, it was a great day on the sea. And if this wasn’t enough, the next day, Simona picked us up and drove us to Villa Britannia, a boutique, historic, restored B&B, where we met the owners, Louisa Vittorio and her partner Marco. Here we had more food of course and toured the lovely property where Louisa hosts cooking classes and wine tastings. The property is beautiful, and the location and view are amazing. I’ll never forget these wonderful friends I made those two days in Sicily. They made me feel at home, and that’s what Sicilians are all about. Grazie mille for a wonderful time that I will always remember! I hope to return soon! Airline deals to Italy are making news. Have you heard that now is a good time to fly to Italy? It’s true. The airfare travel deals are amazing, since the airfares are among the lowest they have been in some time. Some are less than $400 round trip to Rome. I wanted to see for myself, and so I did some checking, just plugging in random dates and departure cities. Although the flight prices are of course, subject to change, this is what I found today. Alitalia has roundtrip nonstop flights from Miami to Rome for less than $600. Emirates will fly you nonstop from JFK in NYC to Milan for $518 roundtrip. If you are traveling from the West Coast, British Airlines has you covered for the unbelievable price of $494 from LAX to Rome with a stop in London on the outgoing itinerary and a stop in Chicago on the return flight. If you can be flexible with dates, you can get to Italy and back this year for less than you think. Again, on Alitalia, a roundtrip flight from Miami to Florence is only a little over $500. I have no connection with Alitalia. It’s just that right now they have a sale that ends Jan. 23, 2017. But I have found flights on KLM and Air France from LAX to Rome round trip for under $500. You just have to keep researching and be flexible with travel dates. Update Feb 21, 2017. Airfares are still low and today the euro is 1.05 to the USD. The deals are still out there. For example, today I found deals for as low as $400 RT from Miami to Rome and $500 from JFK to Rome. It pays to check prices…so make it happen. Stop dreaming about going to Italy. Check the airfares for yourselves and make it happen. Have you visited my Instagram page lately? Please stop by and check out some of my images from Italy.